Hau’oli Makahiki Hou translates to Happy New Year in Hawaiian and from the stories in the Maui News the last few days it appears to be shaping up as so. You might remember when we posted Maui Land + Pine would be ceasing operations her on Maui the end of December. 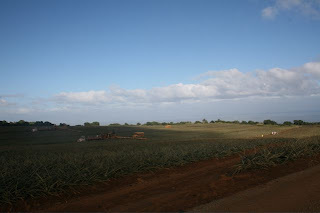 But good news, Haliimaile Pineapple Co. Ltd. has come to the rescue and has taken over 1000 acres in the effort to keep pineapple in the fields. 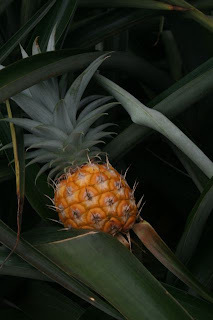 In order for it to succeed, the pineapples need to reach your stores. If you don't see MAUI GOLD pineapples in your stores, please request that they start carrying them. It's been awhile since our last post and we promise to get back to posting soon. We have had our friend William visiting from NY over the Holidays which has not left too much time to blog. We'll be back in a few days with new posts as well as the 2009 Cuckoo Review. i saw that in the maui news online - wonderful! good idea to ask for Maui Gold. . .i shall. maybe i'll bring in my can tops and reallly lay it on.